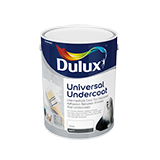 Dulux Undercoat for All Surfaces is a general purpose undercoat for use as an intermediate for decorative topcoats, for interior and exterior use. Provides a smooth base with excellent sanding properties. Easy brushing and good levelling properties. Excellent adhesion on all properly primed or sealed surfaces.